This is an easy and tasty weeknight meal. Very little clean up required and if you make the teriyaki sauce ahead of time…this can be thrown together in under 5 minutes (minus the cooking time of course). If you are vegetarian use tofu in place of the chicken….it is all about the delicious sauce anyway. 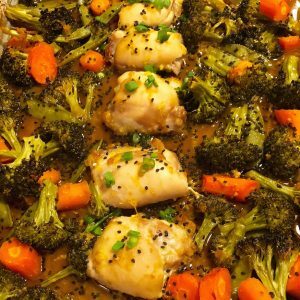 Place the chicken thighs on the baking sheet, surrounded with the broccoli, carrots and snap peas. In a small bowl, whisk together the tamari sauce, sesame oil, orange juice, honey, rice vinegar, garlic and ginger. Pour half the sauce over the chicken and drizzle the rest over the veggies. Bake for 30 minutes, or until chicken is fully cooked. Remove the pan from the oven and sprinkle with sesame seeds. Divide between plates and enjoy! I am so happy that you enjoyed the recipe Tracy!